In light of all the signs converging in the Fall of 2017, it would be wise to consider the solar eclipse on August 21, 2017 as beginning a period of high alert. This period would extend until at least September 30, 2017. It’s possible that this time-frame could include the beginning of wars, earthquakes, volcanic eruptions, tsunamis, and the like. I would personally suggest preparing at least a month’s worth of food, water, medication, and first aid supplies. Consider the possibility of being without electricity, internet, or cell phones. Eclipses are neat. They generate a lot of excitement and speculation. However, I don’t normally put much stock in them prophetically – and here’s why. Eclipses happen frequently (a total solar eclipse happens somewhere every 18 months), they can only be viewed by small sections of the world, and nowhere are eclipses specifically mentioned in scripture. Yes, there are several dark sun / blood moon and dark sun / dark moon prophecies. However, these signs occur together in scripture (usually along with stars falling or stars being darkened as well). We know from the simple definition of eclipses that a solar eclipse and a lunar eclipse can’t occur at the same time. So the passages that involve a darkened sun and a blood red or darkened moon, with accompanying darkened or falling stars, must refer to a different phenomenon than eclipses (such as global atmospheric ash or smoke). I have analyzed the blood moon versus dark moon HERE; and the signs in the sun moon and stars of Luke 21 HERE. I’m not trying to rain on anyone’s parade here, but as a Biblical literalist, I look to Scripture to verify ANYTHING and EVERYTHING that ANYONE claims is prophetic. Reading current events into prophetic scripture is dangerous where no CLEAR link is seen. At best, it generates excitement for nothing, but at worst it leads people away from true Biblical prophecy. The most recent example of this is the “blood moon tetrad” from 2014-5. Each lunar eclipse fell on a Hebrew feast day (April 15, 2014 – Passover; October 8, 2014 – Feast of Tabernacles; April 4, 2015 – Passover; September 28, 2015 – Feast of Tabernacles). Notably, none of these holidays included the Feast of Trumpets, which is the next feast in line to be prophetically fulfilled (nor Pentecost, if that one will be dual fulfilled). People claimed that significant events had happened in Jewish history in years surrounding previous blood moon tetrads. When I looked into this, I found that sometimes the event occurred before the eclipse and sometimes after, and sometimes the time gap between the event and the eclipse was up to 1 year long. This makes it quite a nonspecific sign that is easier to identify in hindsight….in other words, not a very good prophetic sign at all. I personally feel that God is very clear when He wants to send a sign. So…. the “blood moon tetrad” of 2014-5 came and went, with no wars or temples or covenants or raptures. Currently, some people are identifying that these eclipses may have been pointing to the Revelation 12 sign all along, but again, this is coming in hindsight. I find it interesting, but not compelling. So with that stern warning in mind, let’s take a look at the August 21, 2017 solar eclipse occurring over the USA. I am not aware of any previous solar eclipses being claimed as significant in recent history. However, it does appear that God has possibly used a solar eclipse at least once to bolster the message of His prophet. Around the time of the prophet Jonah, there was a solar eclipse over the area which would have included the city of Nineveh. If you recall, Jonah was sent there (after his initial rebellion and the whole big fish scenario) to warn the king and the city’s inhabitants that if they did not repent within 40 days, that God would destroy Nineveh. The people repented, and God forgave them. The city was not destroyed. There is no proof that the solar eclipse occurred on the day when Jonah went to the city, and some suggest that the eclipse occurred a month before Jonah arrived. It cannot even been conclusively proven this eclipse occurred the same year that Jonah went to Nineveh. There is no corroborating scripture to indicate that the eclipse occurred in Jonah’s lifetime at all, although secular data suggests he lived in the corresponding time frame. The solar eclipse over Nineveh may have been coincident and may have given additional weight to Jonah’s message. We just don’t know. If it were important that we knew, God would have told us. The August 21, 2017 solar eclipse has nothing to do with the “sign of Jonah”. The sign of Jonah CLEARLY was that just as Jonah was in the belly of the fish for 3 days and 3 nights, Jesus would spend 3 days and 3 nights in the grave (Matthew 12:38-45). The Bible does not suggest further meaning beyond this. Where scripture is silent, it’s usually best to be silent. I believe that the recent popularity of comparing the August 21, 2017 USA solar eclipse to the days of Jonah is an error. The main issue I have with comparing the Aug 21 2017 eclipse with Jonah, besides the lack of corroborating scriptural evidence, is that in Jonah’s day God had a specific mouthpiece with a specific message. And the message was that obedience = no wrath. If this message were being paralleled today, then it would be clearly revealed and repentance would stay God’s wrath. If you have read the book of Revelation, you know that even if the entire country of America repents, God’s wrath is coming upon the whole world anyways (although individual believers, of course, would be spared). The other issue I have with claiming the Aug 21 2017 eclipse is a warning sign from God, is that since God’s wrath will be worldwide in scope, the warning should be too. If the eclipse were over Finland, or Australia, instead of the USA, would people assign the same weight to it? It’s one thing to interpret it as a sign; it’s another thing entirely to claim a specific message from God attached to it where He has been silent. Is the August 21, 2017 Eclipse Significant? Israel, the fig tree, “leafed out” in 1948. The generation that won’t pass away before “all these things are fulfilled” – from the fig tree budding to the second coming of Jesus Christ – would end somewhere between 2017 (using 360-day-year prophetic counts) and 2028 (using standard year counts). The Revelation 12 Sign is set to occur September 23, 2017. The Giza Pyramid Sign is set to occur September 20, 2017. The Third Temple is ready to be set up at a moment’s notice. More nonspecific signs (general violence, sexual immorality, homosexuality, DNA manipulation, increased transportation, increased knowledge, decreased morality, increased scoffing and mocking, decline in sound doctrine in the church) have been in place for a while now. The path of the eclipse in 2017 appears to follow a fault line called the “1,700 mile Crack Across America”. 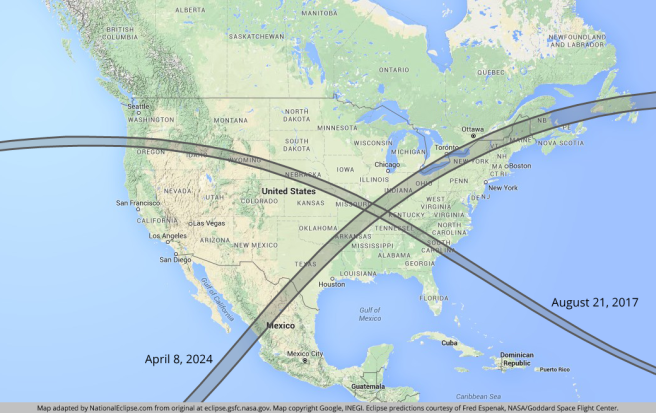 Interestingly, in ~ 7 years another total solar eclipse will cross the USA, this time in the opposite direction. However, I will point out that the eclipse on April 8, 2024 does NOT fall on any significant dates (Passover is April 23, 2024, but the significant days that year would be possibly Feast of Trumpets, October 3, 2024 and/or Yom Kippur, October 12, 2024). It may be apparent to those around that time what it might signify. Between the two eclipses, a giant X is formed over the contiguous United States. 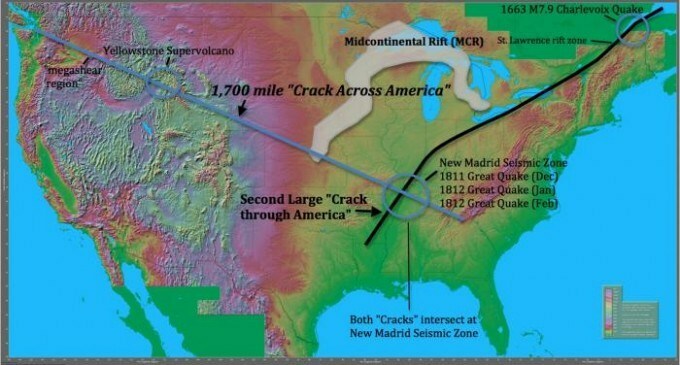 The April 2024 eclipse also follows the path of a Fault Line – the “Missouri Gravity Low”. I don’t put much stock in numbers analysis and the specific towns the eclipse covers (as the towns it crosses that no one finds significant are omitted from the list…). However, if you’re into that kind of thing you can read more about these connections surrounding the August 21, 2017 Eclipse: HERE and HERE . And here’s a YouTube clip covering the New Madrid Fault Line connection. I find the X across America along fault lines very interesting. I can’t foresee significance to the April 8, 2024 date. A possible connection might be establishment of the mark of the beast system on this date, but that might be a big stretch. I do see significance with the August 21, 2024 date as it occurs exactly 40 days from Yom Kippur (the Day of Atonement). 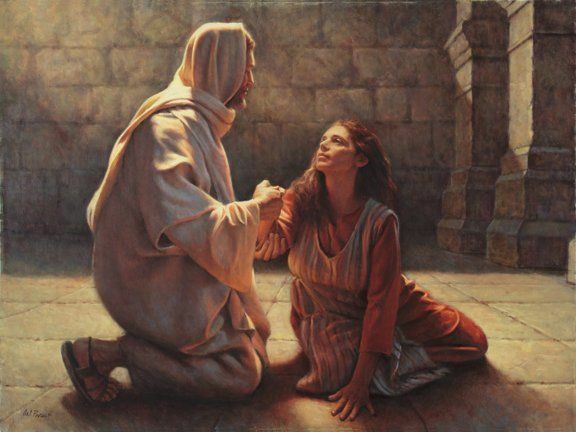 40 is a frequently used number in the Bible as a time of testing, such as the 40 years of wandering in the wilderness, Jesus’ 40 days fasting in the desert, and Moses’ 40 days meetings with God on Mount Sinai. This 40 day season coincides with the Season of Teshuvah, which in Jewish religion is a time of repentance before the Day of Judgment. (Think of it as a Jewish parallel to the Catholic practice of 40 days of Lent). As a human tradition, it does not carry the weight of one of the Feasts of God. However, when we dive into a study of the month of Elul and the Season of Teshuvah, we start to uncover some interesting facts. The month of Elul is a time of repentance in preparation for the High Holidays of Rosh Hashanah and Yom Kippur. Tradition teaches that the month of Elul is a particularly propitious time for repentance. This mood of repentance builds through the month of Elul to the period of Selichot, to Rosh Hashanah, and finally to Yom Kippur. According to tradition, the month of Elul is the time that Moses spent on Mount Sinai preparing the second set of tablets after the incident of the golden calf (Ex. 32; 34:27-28). He ascended on Rosh Chodesh Elul and descended on the 10th of Tishri, at the end of Yom Kippur, when repentance was complete. Other sources say that Elul is the beginning of a period of 40 days that Moses prayed for G-d to forgive the people after the Golden Calf incident, after which the commandment to prepare the second set of tablets was given. During the month of Elul, from the second day of Elul to the 28th day, the shofar (a hollowed out ram’s horn) is blown after morning services every weekday. See Rosh Hashanah for more information about the shofar and its characteristic blasts. The shofar is not blown on Shabbat. It is also not blown on the day before Rosh Hashanah to make a clear distinction between the rabbinical rule of blowing the shofar in Elul and the biblical mitzvah to blow the shofar on Rosh Hashanah. Four blasts are blown: tekiah, shevarim-teruah, tekiah. Rambam explained the custom of blowing shofar as a wake-up call to sleepers, designed to rouse us from our complacency. It is a call to repentance. The blast of the shofar is a very piercing sound when done properly. At Hebrew4Christians, a Messianic Jewish site, we learn some more interesting information. According to Jewish historians, Moses actually ascended on Mount Sinai THREE times for forty days and forty nights. His first ascent was on Shavuot (Pentecost), 50 days after the Exodus (Passover). This is when Moses received the 10 Commandments and the Torah. He descended, saw the Israelites worshiping the golden calf, and smashed the tablets. The next day, he burned the golden calf and made them drink it. He then re-ascended Mount Sinai the following day and interceded for God’s mercy on Israel for 40 days. He descended without an answer from God. God called Moses the following day to ascend Mount Sinai a third time, where the second set of tablets was completed along with the Torah. Moses then descended on Yom Kippur (Tishrei 10) with God’s assurance of forgiveness. God’s timing is never arbitrary. The process of the giving of God’s covenant of the Law both began on Shauvot (type), and was confirmed on Shauvot (Pentecost – fulfillment). While the Old Testament understanding was the “letter of the Law”, the New Testament understanding is the “spirit of the Law”. In the Millennial Kingdom (Feast of Tabernacles), Jesus’ rod-of-iron-rule would appear to include both the letter AND the spirit of the Law. The last 40-day period of Moses on Mount Sinai is what is commemorated as the Forty Days of Teshuvah. This is a season of repentance and “soul-searching”. The theme verse is Isaiah 55:6 – Seek the Lord while he may be found; call upon him while he is near. The 40 days includes the entire month of Elul, then culminates in the first 10 Days of Tishrei. These are the 10 Days of Awe between the Feast of Trumpets and the Day of Atonement, during which one’s eternal fate is believed to be “sealed”. Due to the August 21, 2017 eclipse’s timing (starting the 40 days of Teshuvah) and its’ proximity to the Great Sign on September 23, 2017, I believe it’s a wise idea to do some serious soul-searching to examine yourself and see if you are in the faith (2 Corinthians 13:5). Preparations (food, water, medical supplies) to enter “the time of birth pangs” is probably wise as well. Even if there was only a 1% chance, wouldn’t you want to be prepared? The Bible clearly spells out what will happen at the end of the church age… and it’s not going to be nice. Is there a way of escape? Absolutely. Those who believe in Jesus, the Messiah of the Old and New Testaments, and trust in Him alone for salvation will not have to suffer the coming time of upheaval on Earth. Today is yesterday and tomorrow. Just a thought of Eternity. Come, LORD JESUS. All lunar eclipses take place on a feast day. The 7th day Sabbath is declared a feast day in Leviticus chapter 23. The Sabbath always falls on the full moon, when eclipses take place. Psalms 104:19 “the MOON is appointed for festivals”. The 7th day Sabbath is the very 1st festival listed in the Torah. Therefore, the moon declares the 7th day Sabbath. The 4 weekly phases of the moon directly after the sighting of the new crescent moon, determine the weekly Sabbaths. The moon perfectly has 4 quarterly phases totaling 7 days each. As you’ll notice, during the exodus from Egypt, when God was teaching the Israelites his calendar and Sabbaths, for the first 3 months, the Sabbath always fell on the 15th day of the month after the new moon day. Learn from this. The 15th of every luni solar month is always a full moon. This is why in the very first chapter of Genesis God tells us the moon was given for days and years, for signs in the sky, to be observed.